Marv Schuette’s 45 years of leadership and vision at Wausau Homes helped the company become the nation’s leading producer of custom homes. The story of Marv Schuette is also the story of his brothers Earl and Cliff. Earl Schuette had the ideas; Cliff Schuette, along with brother-in-law Jack Peterson, provided much needed capital; and Marv Schuette made things happen. Marv Schuette graduated in 1954 from UW Madison with a degree in economics after his older brothers insisted he go. Earl then asked Marv to join the family business and “Make something out of this lumberyard.” That was all the direction Marv needed! Marv Schuette was very innovative and a very hard worker. 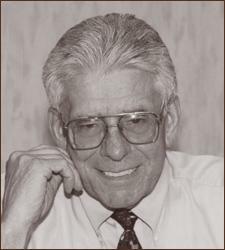 He introduced plywood and sheetrock to the area, and in a few short years transformed the small lumberyard into a modern one-stop building center that was the largest in central and northern Wisconsin. In 1960, Earl Schuette started Housing Services Corporation which became Wausau Homes, Incorporated in 1964. Marv Schuette was invited to join this latest venture in 1962 to help increase sales. With aggressive sales and marketing innovations, Marv Schuette spurred tremendous growth at Wausau Homes. By 1973, the company was producing 2000 homes a year (40 per week) and had a one year backlog. In 1975, Wausau Homes opened its current seven-acre indoor construction facility that is still one of the most impressive facilities of its kind in the world. The facility produced 16 homes per day at the peak of its volume in 1979. Despite a severe recession in the early 1980s, Marv Schuette continued to innovate. The Wausau Homes building system was completely revamped to become more like traditional construction, the company opened a plant in central Florida where housing was still being built, and WH Transportation was created to haul freight for third parties. As the economy grew in the 1980s, Wausau Homes, Sterling Building Systems (an acquisition) and WH Transportation grew, too. In the 1990s and 2000s, Wausau Homes and Sterling expanded with branch plants to serve a larger geographic area. Marv Schuette loved to work. He put in a full day on September 13, 2007, the day before he died, which was just what he wanted to do. Marv Schuette and Ruth, his wife of 49 years, supported many local organizations including but certainly not limited to the United Way, the Community Foundation of North Central Wisconsin, Habitat for Humanity, and Junior Achievement. Marv and Ruth Schuette also built and donated both the Boy Scout / Girl Scout Center and the Meade Wild Life Center on behalf of the employees and builders of Wausau Homes. Marv Schuette was modest about bringing any attention to himself, most often attributing his personal donations as being from “the employees of Wausau Homes.” In 2007, he received the Wisconsin Business Hall of Fame Gold Leadership Award from Junior Achievement. Junior Achievement of Wisconsin’s North Central District is proud to honor Marv Schuette as 2010 Champion of Business.